Performance order will be determined by SCC and will be announced shortly after registration closes. See Schedule for timing and running order. Large vs. Small Ensemble placement will be determined by taking the median of the registered choir sizes so that there are an equal number of choirs competing in each division. These groups will participate in the excitement of the Championships without the added pressures of fielding a competitive set. Schools in this division will perform a minimum of two contrasting pieces to an audience of supporters and fans and receive valuable feedback from our judges. However these groups will not be scored nor be eligible for awards. Participants must be enrolled in a full time high school program at the time of the competition to be eligible to participate. First year CEGEP students from Quebec can participate with the high school they previously attended in grade 11. First 15 choirs to register will compete. Registration closes January 31, 2019 or when the schedule is full – which ever comes first. The final number of choir and band members will need to be submitted at this time. An invoice will then be issued for balance of fees owing, payable by April 1, 2019. Register early and secure your spot! Directors, choreographers and support staff (to a maximum of 6) are admitted to the event free of charge. Click here for additional registration info and form. Customized student/teacher workshops are available starting at $10 per student (minimum 20). We will work with your school to personalize a workshop to address your specific needs (for example: Show Choir 101, Vocal, Dance/Choreography, Music, Show Design etc). Or schedule a ‘fine tuning’ session and have one of our SCC experts come to your school and offer valuable feedback on your show before competition. A shared warm-up / holding area will be assigned and available to each group for a minimum of 60 minutes before their performance time. Dressing rooms will also be available during this time. Once groups are marshalled to the pre-stage holding area, they should be prepared to transfer to the stage at any given moment. However if the event is running on-time, they will have an average of 20 minutes in this private space before moving to the stage for any final preparations. We will do our best to advise groups on timing as they get close to their performance time. Thirty (30) minutes will be allotted for each group’s performance. This includes set-up, performance and tear-down. A penalty of 10% of the overall score will be applied for exceeding the time limit. Show Choirs should perform a minimum of three contrasting compositions, including one ballad. Movement during the ballad should be kept to a minimum. There will be a five-minute on-stage critique by the adjudicators following the teardown. It is recommended to have a maximum performance time of 20 minutes in order to allow adequate time for set-up and tear-down. We encourage schools to keep the performance material age-appropriate and family-friendly. For more information on a typical Show Choir design and format please refer to “Standards”. All four rows of risers will be preset and any requests to add to them must be approved in advance by SCC. Set pieces / backdrops must be generally QUICK AND SIMPLE to set-up within the 5 minutes allowed. Set pieces must be pre-approved by SCC and the venue. Approval process: email design and descriptions of proposed set pieces to info@showchoircanada.com as early as possible but no later than Feb 1. Area/Condenser mics will be placed overhead to cover the riser area as well as across the front of the stage. Eight (8) cordless handheld microphones will be available for the soloists. Monitors for the singers and band will be placed where necessary. Most Show Choirs that compete use a live back-up band. To receive adjudication from the Band Judge there must be no more than one adult (director or otherwise) or professional musician in the band. All others must attend the high school they are representing or be of high school age for the community groups. Recorded instrumental accompaniment tracks need to be sent to SCC by April 1. Groups with multiple tracks should consider editing them into one single track (with suitable transition times inserted) so that the track can be started and left to play right through to the end of the performance. It is always advisable to bring a back up on a USB stick. 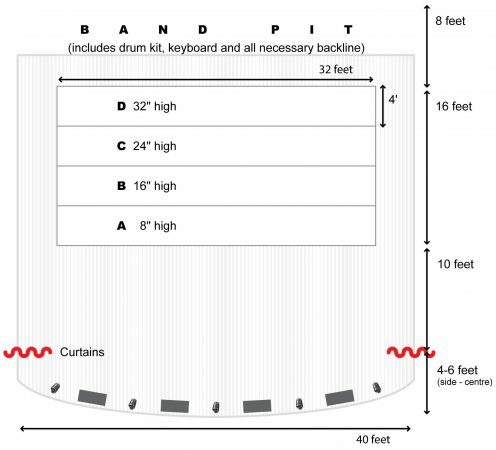 The band will set up on stage behind the risers. Show Choir Canada will provide a drum kit, electronic piano and all other necessary backline (guitar, bass and keyboard amps). Choirs may bring their own keyboards only if they wish. The stage will be preset with a few basic lighting looks/designs to be controlled by the venue lighting operator. Confetti, streamers, sparklers, etc. are not to be used in the theatre. Due to fire codes, pyrotechnics are strictly prohibited. Directors may not perform with the choir other than in the capacity of a musician (see accompaniment section). All participants must be enrolled at the time of the competition at the school they are representing other than those who are competing as a Community Choir (see Age/Grade Eligibility above). Immediately following the competition, all choirs will be presented with a participation award. Please have two representatives from your choir in costume on stage to accept the awards. The three highest scoring Show Choirs in each division will receive trophies and other prizing TBA. Individual and group awards will also be presented. The Show Choir with the top overall score will be crowned the Show Choir Canada Champions. Outstanding achievement in overall combo. Actively and consistently supports the choir. Includes tone, pitch, blend, balance to the choir, dynamics and difficulty of literature. Four adjudicators (3 Choir and 1 Band) who are industry experts will evaluate your performance. Adjudicators will provide a five-minute, on-stage critique immediately following each performance. A copy of the newly adopted adjudication form, along with the judges verbal comments with Video Judge will be given to each choir director. Once again we will be using the following scoring system and Video Judge. We take great pride in hiring fair, competent, unbiased adjudicators. Appropriate and courteous audience behaviour is expected of all participants. No one will be permitted to enter or leave the theatre once a group has started performing.